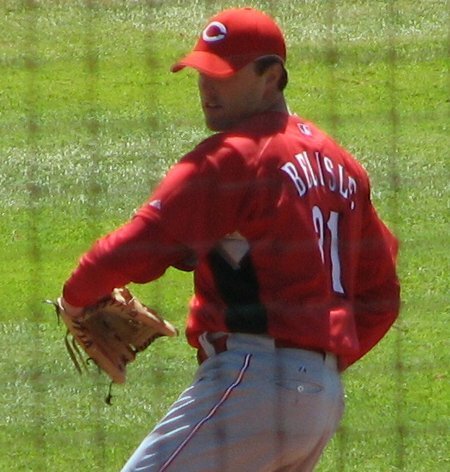 The Reds won over the Rays on Sunday, 6-4, in St. Petersburg. Our trips to this stadium are invariably wonky. There was the year we thought it was a day game only to find we’d arrived four hours early. There’s been shivering under blankets in the stands. And this year, it was arriving at a tiny little sports complex around 80th street. The CTS thought something was off from the beginning, but we thought maybe they’d just moved where they had the spring training games. However, as we pulled into a half-full parking lot that accommodated 50 cars, max, we were sure something was up. The Rays might not pull in the crowds that some teams do, but they didn’t practice at the softball field. We did make it back downtown and found the stadium from memory and were in our seats with time to spare before the first pitch. 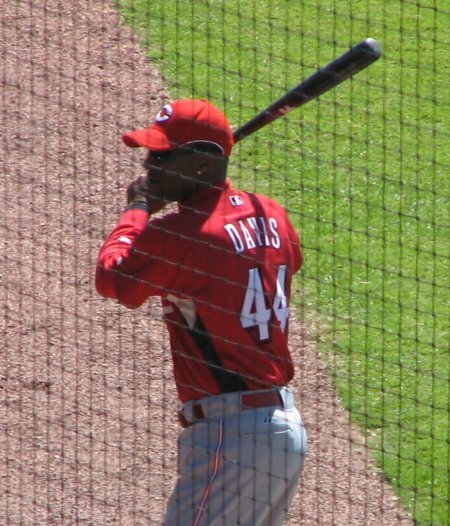 Guest instructor Eric Davis was in attendance, showing off his swing before the game. Woo, he’s trim for an ex-player. I wonder if he’s ever considered pitching. 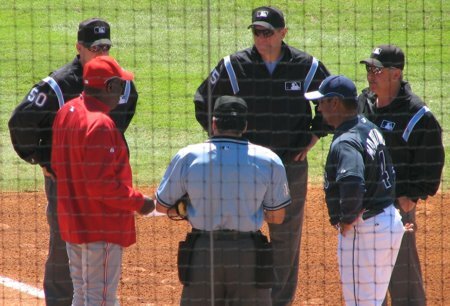 Dusty Baker hands the line-up card over to a throng of umps. 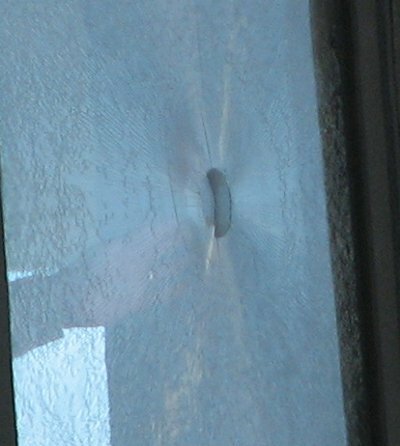 …that went right through one of the panes of glass in the press room window. Stuff like that really makes you think about how fragile your skull would be. 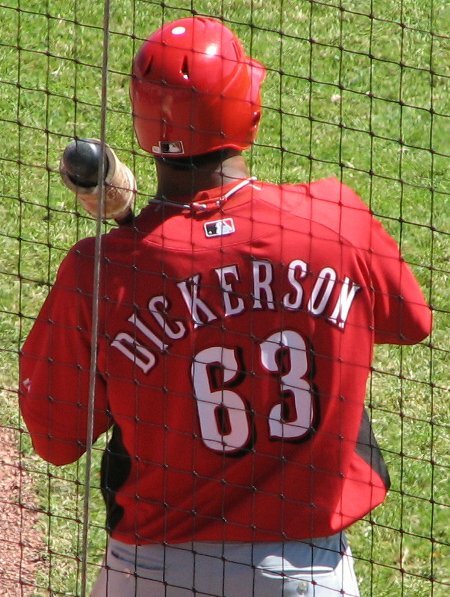 Chris Dickerson was among those who didn’t get to skip the road trip. He was 0-1 with a walk. 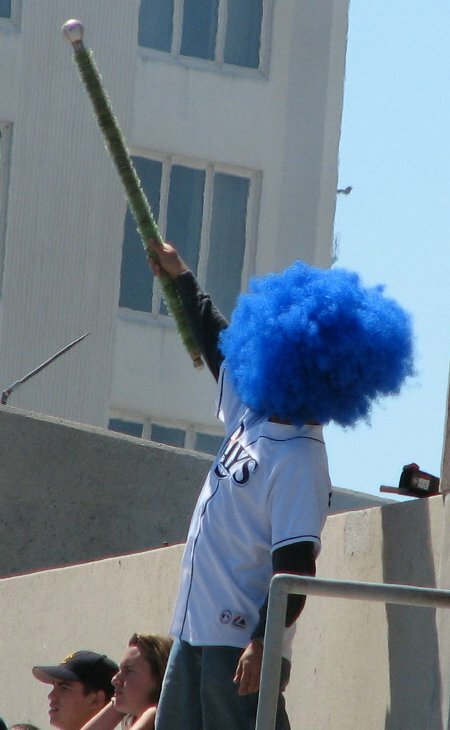 Ah, the Cowbell Kid, his cow bell and foot-tall blue hair entertaining the masses wherever he went. I actually made my way over to interview him, only to find later that the iRiver had been set to “line-in” instead of “mic” causing nothing to be recorded. If there’s any stupider feeling than talking into your own hand as you walk around the stadium, it’s learning later that your hand had not been recording the conversation. In any event, he told me that he’s just a fan and pays for tickets for the honor of providing the service he provides. He senses something different about the team this year, which undoubtedly has something to do with the team doubling the payroll. And he gave me an appreciative “I can see that,” when I told him the name of my blog, so he’s got my approval. Oh, and he’s got a grill. You can read more about him at his mySpace page. The game finally wrapped up, the final score showing a closer outcome than it really was. 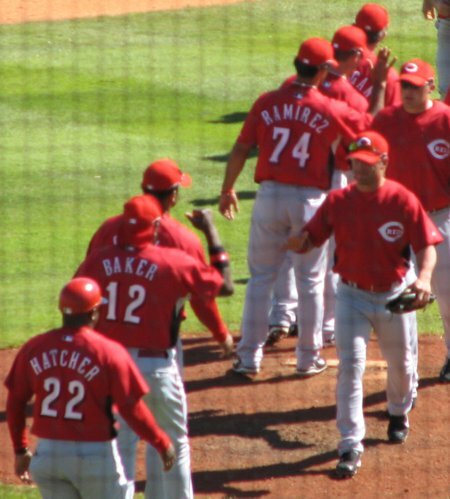 And after an important and hard-fought battle, the Reds congratulated each other.